Yep, she’s right. My pal Tracy Schneider imagined aloud in a blog post that when I wrote Gourmet Game Night I was likely “thinking of Scrabble, poker or backgammon” rather than football. I don’t care much for the game, actually. Never watch during regular season. The last Super Bowl I watched was when the Seahawks played and you know how that game went! I get worked up too easily and just can’t take that kind of stress…. Right on, though. Whichever “game night” you subscribe too, the game being played deserves to be the focus. The food is delicious and satisfying, but not center-stage. Nothing puts a damper on the momentum of a fun round of Cranium like the host leaving the table for ten minutes to pan-fry steaks. And is it really worth the risk of missing the 70-yard kick-off return, because you had to get those chocolate soufflés out of the oven? What you need is food that can be made ahead and holds up well for a few hours. Food that’s easy to eat and doesn’t require big plates, lots of table space, pesky utensils. That’s what you need. Here’s one option. Who doesn’t love pimento cheese, right? I had very little experience with the stuff until a trip to Kentucky a few years ago introduced me to the glories that are cheese blended with peppers and bound with a bit of mayo. 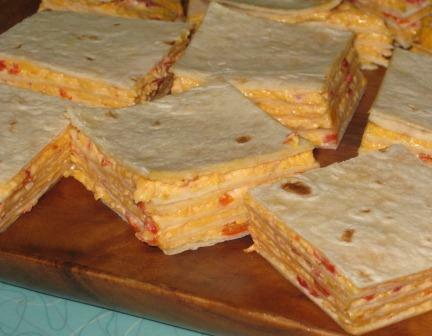 I went a bit creative with the concoction for my book: instead of making an everyday sandwich, I spread the cheesy goodness between flour tortillas then cut them into little “towers.” You can instead just sandwich the mixture between a couple slices of bread. Or serve as a decadent dip for carrots and cucumbers. Or schmear on bagel chips, crackers or anything else that served as an edible perch. So, this is my extent of joining the Super Bowl hoopla. Sharing my variation of pimento cheese with you. Enjoy. Combine the cheese and mayonnaise in a food processor and pulse a few times to blend and finely chop the cheese. The mixture should still have some chunky texture. Transfer the cheese mixture to a medium bowl and fold in the pimentos and peppers until thoroughly blended. That’s all there is to it! Spread thin layers on large flour tortillas if you want to replicate my Gourmet Game Night version, and use a serrated knife to cut the stack into squares. But there are loads of ways to serve this simple combo. Have a ball.